Welcome to the party, the Fish Party! With the cutest characters under the sea, get ready to dive into this tropical adventure that bubbles with fun! 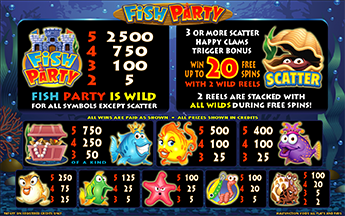 Playful sea creatures guide the player through pay lines and exciting Free Spin rounds that will bring a sea of good fortune! 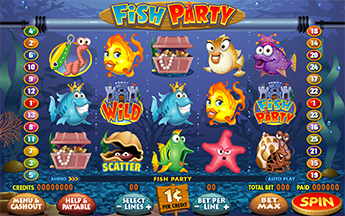 3 or more Clam Symbols in any position awards up to 20 Free Spins. During free spins 2 reels are randomly selected for each spin to be stacked with all wilds! Free Spins can be retriggered.